Free Mistabishi sounds are just a download away. Whether he's making massive rave jams as Mistabishi or indulging his experimental dubstep side with Lol, James Pullen is never less than exciting and innovative. Now our friends at Computer Music magazine have cajoled him into creating a collection of 800 drum 'n' bass and dubstep samples for their VIP series, and SampleRadar is giving you 50 of them right here. These represent just a taste of what you can expect if you pick up the September issue of Computer Music, the cover DVD of which contains the complete Mistabishi collection. The magazine is available in UK stores now and can also be purchased online from myfavouritemagazines.co.uk. 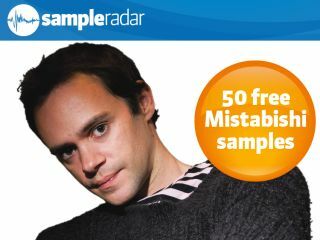 Click here to buy Mistabishi - Drum and Bass Vol 4 from the MusicRadar sample store. The samples are split into ten folders, each of which is labelled according to the type of samples that it contains. All the samples are supplied as 24-bit WAV files so can be imported directly into your DAW or sampler of choice. Because they're royalty-free, you're welcome to use the Mistabishi samples in your music in any way you like - all we ask is that you don't re-distribute them. The Mistabishi samples are supplied in a zip file, so you'll need to extract them before you can see them. Enjoy!